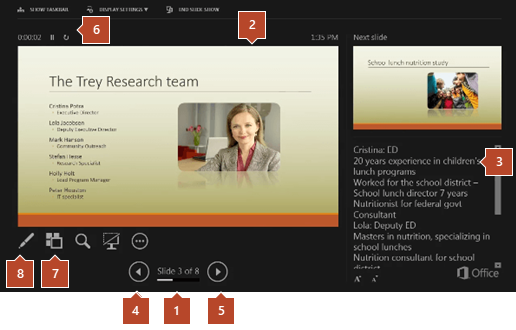 Get an overview of Presenter view and learn what's required to use it in PowerPoint. Ensure that the computer you are using for your presentation supports the use of multiple monitors. If the computer has multiple input ports, such as DVI, VGA, HDMI, ir DisplayPort, it should support multiple monitors. Most modern desktop computers have multiple monitor support built in; if not, you'll need two video cards. Presenter view lets you view your presentation with your speaker notes on one computer (your laptop, for example), while the audience views the notes-free presentation on a different monitor. Note: PowerPoint only supports the use of two monitors for a presentation. However, you can configure to run a presentation on three or more monitors that are connected to one computer. Check your computer manufacturer’s website for up-to-date information about multiple monitor support for your computer. Speaker's notes are shown in large, clear type so that you can use them as a script for your presentation. You can darken or lighten the screen during your presentation and then resume where you left off. For example, you might not want to display the slide content during a break or a question and answer period. In Presenter view, icons and buttons are large enough to navigate easily, even when you are using an unfamiliar keyboard or mouse. The following illustration shows the various tools that are available to you from Presenter view.